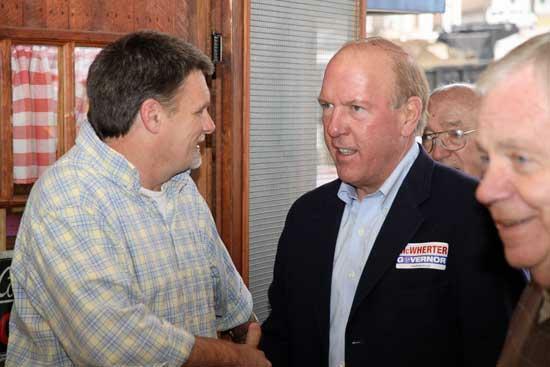 Randy Barrett, owner of Joe's Place, greets gubernatorial candidiate Mike McWherter Tuesday. Also in attendance were Woodbury Mayor Harold Patrick and Vice-Mayor Charley Harrell. While Mike McWhether is quite happy to be the son of one of Tennessee's most popular governors in recent history, he wants to make a name for himself in his own right. McWherter, son of former Governor Ned Ray McWherter, visited Woodbury Tuesday afternoon to campaign for the position held by his father from 1987 to 1995. "One big piece of advice my father has given me is that 'Mike, you need to listen more than you talk,' the younger McWherter, who has visited over 60 of Tennessee's 95 counties to date, told those who came to Joe's Place Restaurant to welcome him to Cannon County. "I really have tried to be in tune with the needs that people are expressing to me as I travel the state." McWherter said Tennessee's rural areas will play a key role in his campaign, and they will be important to him if he is elected. "I appreciate you all coming out here very much. This area will be very important to me in my race both in the primary and general election. Your help and support is going to be critical." McWherther said he wants to become Tennessee's next governor, "because, as you look across the landscape of Tennessee, you have literally seen thousands of jobs disappear. Our unemployment rate last month was 10.9 percent. That's the highest it's been in my lifetime." McWherter owns and operates a successful small business in Jackson. A West Tennessee native and graduate of Union City High School, he earned his law degree from Vanderbilt University and worked in private practice in Nashville before moving to Jackson to start his own business and work in the community. Mike is the Chairman of the Bank Board of First State Bank, headquartered in Union City, and serves on the board of directors for the Jackson Energy Authority. "I think the next governor of Tennessee has got to be someone who puts the creation and maintenance of jobs front and center on the agenda," McWherter said. "Now, I'm a businessman, I'm not a politician, but as I look across this state I'm seeing some huge challenges such as health care and education as well as unemployment. "In order for the next governor to be successful, that individual has to be somebody with the skills and the background who understands how to deal with this economy, how to create jobs, and I think most importantly now how to maintain jobs." McWherter said the next governor will have to put people's interests now ahead of politics. "We, collectively, have got to build an education system in this state that allows our kids to go out and compete on a global basis and its going to have to be done where we can balance our state budget without an income tax and in such a way as to not harm essential services for our working families and at the same time maintain the revenue to build our infrastructure so we can create jobs." McWherter is the father of two children, ages 18 and 16, and said he wants to secure the future of Tennessee for not only them, but all of Tennessee's children. "My dreams for both of them is that they can live in a state where they can find good paying jobs, have adequate, affordable health care and be able to raise families of their own. For that to happen, for their entire generation coming out of high school, our state is going to have to have strong leadership."